Aluminum can be seen everywhere. Aluminum extrusion profiles have a single appearance without surface treatment and easy to corrosion in humid air or other harsh environments. It is difficult to meet the high decorative and weathering requirements of building materials.In order to improve the decorative effect, enhance the corrosion resistance and prolong the service life, the extruded aluminium profiles are generally subjected to surface treatment, and the aluminum surface treatment becomes an indispensable important section in the aluminum processing. Fluorocarbon spraying is one of the aluminum surface treatments. The application of architectural coatings in exterior wall decoration accounts for about 60%. The construction industry is the largest area for coating applications and the largest market for fluorocarbon coatings. Fluorocarbon coating is one type of electrostatic spraying, and the other type of electrostatic spraying is powder coating. The fluorocarbon coating is uniform in color, and the excellent quality fluorocarbon coating has metallic luster, vivid color, and a clear three-dimensional appearance. Even if the building is expanded after many years, the old and new colors can still be seamlessly matched. Fluorocarbon spraying has excellent resistance to fading, anti-blooming, anti-air pollution (acid rain, etc. ), corrosion resistance, wear resistance, weather resistance, anti-aging, anti-ultraviolet ability, strong crack resistance and can withstand severe weather conditions specialty. The powder coating is afraid of the sun's ultraviolet radiation, relatively weak resistance to fade. According to the respective characteristics of fluorocarbon spraying and powder spraying, the general outdoor aluminum extruded products will basically choose to use fluorocarbon spraying. The indoor structural aluminum extrusion profiles are mostly powder sprayed, and the hidden parts are also anodized. 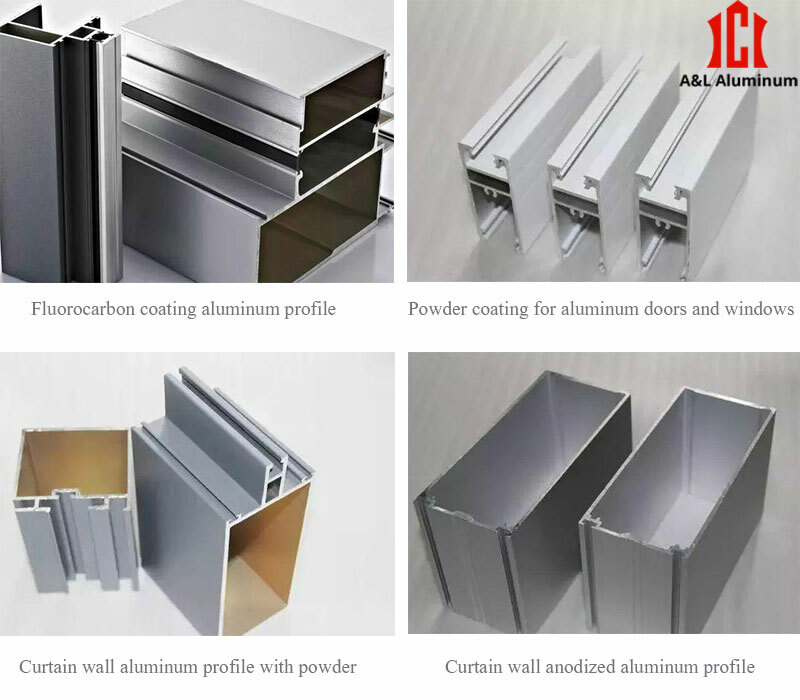 Outdoor aluminum profiles, including curtain wall plate, pinch plate, decorative plate, exterior aluminum sheet, exterior aluminum grille, etc., should generally be treated with fluorocarbon spraying, otherwise fading and surface cracks are likely to occur, especially when the weather is heavy. In areas with strong wind pressure and strong ultraviolet radiation, high-quality surface treatment is needed. For non-outdoor curtain wall aluminum profiles, such as curtain wall columns and beams, powder spraying is generally used. For the aluminum windows, the outdoor part of the heat-insulation profile can be regarded as fluorocarbon coating, and the indoor part of the heat-insulation profile can be regarded as powder coating, considering comprehensively the architectural effect, real estate positioning, cost, construction, use function and durability. Fluorocarbon spraying has been applied earlier in the world. In the past few decades, fluorocarbon spraying technology has been widely used in Australia, the Middle East and Southeast Asia such as Singapore, Malaysia and Thailand. In recent years, with the rise of high-end markets, the need for high-standard coatings for building exterior walls has also increased. As an environmentally friendly coating, the fluorocarbon coating is chemically resistant, resistant to corrosion by strong acids, alkalis, and organic solvents, and its properties such as heat resistance, aging resistance, lubricity, and insulation make it particularly suitable for lining materials for chemical equipment. The anti-corrosion protection, super-duration decoration of high-grade building outdoor aluminum, etc., are widely used in construction, anti-corrosion, highways, railway bridges, transportation vehicles, ships and marine engineering facilities, and have great application value. Fluorocarbon coating profiles as high-grade building profiles, the quality requirements of the entire process are extremely strict. After reading this blog, do you want to learn more about related information such as "What is the fluorocarbon coating process for aluminum profiles"? Please follow us and we will update more knowledge for you.